Last week I shared the topic of “hope” with you. Ironically, yesterday I received news about a friend of our family who had given up all hope. After years of struggling with alcoholism and depression, he lost his job, his health, and his marriage. I suppose he could see no way out of his pain, even when friends and family tried everything to help him. When he found a time alone at home, he took his own life. It was such a shock. His family’s feelings are running the gamut from heart-wrenching sadness to guilt to anger. Why did he do it? Why didn’t he let us help him? Where was God in this? How could he do this to us? What else could I have done to stop him? What makes a person give up hope, even in God? Proverbs 13:12 says, Hope deferred makes the heart sick. David did not take his own life because he trusted in his God. For lots of others, God has been far away or they have never had the chance to know God at all so there was no hope. And what about those who loved the one who died this way? I know from what I have read that a loved one’s suicide can trigger intense emotions. Shock. Disbelief and emotional numbness may set in. They may think that their loved one’s suicide couldn’t possibly be real. Anger. They may be angry with their loved one for abandoning them or leaving them with a legacy of grief - or they may be angry with themselves or others for missing clues about suicidal intentions. They may be angry with God for not intervening or angry with their loved one for not taking the lifeline held out for them. Guilt. They may replay “what if” and “if only” scenarios in your mind, blaming themselves for the suicide. Despair. They may be gripped by sadness, depression and a sense of defeat or hopelessness. They may have a physical collapse or even consider suicide themselves. “The thoughts, feelings, and emotions of a person contemplating suicide are difficult to understand. So many different circumstances can be involved. Many people with suicidal thoughts are struggling with despair, hopelessness, and depression, and they reach the point where the struggle becomes too unbearable. With others, something has altered their normal thought patterns. Perhaps a chemical imbalance progresses into emotional and mental instability. Or the mind is altered by alcohol or drugs, which could result in an ‘impulse’ act of suicide. It is not out of the question that perhaps a combination of these circumstances exists. And sadly, even those who are very close to someone with suicidal thoughts may never know that person’s thoughts and feelings. Suicide is a topic rarely discussed in polite society, or in the church, for that matter. While it is a subject whispered behind cupped hands or alluded to in the form of a prayer request, “we need to pray for that family because of the circumstances of his death,” suicide is rarely confronted openly. I read that loved ones of the suicide victim desperately need the opportunity to talk openly about the complex emotions they are experiencing. Suicide literally explodes into a person’s life like an earthquake registering off the Richter scale. Life changes in an instant for suicide survivors.. As with the survivors of an actual earthquake, suicide families are in shock, simply existing in the wake of the destruction. As if the death of a loved one were not enough to handle, suicide survivors must deal with the shame of the social stigma attached to suicide. In general, people do not know how to react to or comfort suicide families. A shadow is cast across the entire family as if something must be wrong with them all. As with any death, people often feel talking about it will upset the family so they avoid the subject. What they don’t understand is the survivors need very much to talk about what has happened. Healing will never take place if the gaping wound of suicide pain is covered over without being allowed to heal from the inside out. Suppose an earthquake seriously damages the foundation of a home, yet the house appears otherwise intact. There are obvious cracks, but instead of making the necessary inspection and repairs, the owner opts for stuccoing over the damaged foundation. From the exterior, the repairs seem complete. However, one day an aftershock trembles the already insecure foundation and the whole house comes crashing down. Waiting to address the damage done by suicide only postpones the inevitable. Talking about what has happened is a vital part of the healing process. Huge chunks of unreconciled pain lay scattered in the path of recovery for suicide survivors. While picking through the rubble, the ordinary things of life must go on. Amid the chaos of second-guessing and “what if’s,” survivors must deal with the mundane issues of the funeral, finances, paperwork, probate, and insurance claims. Many Christians do not know how to respond to suicide, and in their ignorance, often do more harm than good. A lot of what I read written by Christians was about whether the sin of suicide was unforgivable or not. Some felt compelled to pass judgment on the circumstances of the death and speculate about whether the victim is in heaven or hell. God is the only Righteous Judge and the status of the soul of the deceased is in His hands. Many a survivor has turned his back on the church and God following a judgmental statement by an overly pious pastor who preaches that the deceased has gone to hell. When people don’t know what to say, but feel they are expected to say something, their comments can sometimes be hurtful. Instead we should be showing compassion at a time like this. Here is some good advice I read for friends and family who wish to comfort the survivors. You can be the most helpful to the survivors by being available and listening. Don’t feel you have to inform or justify. Because suicide is an awkward, uncomfortable subject, people are tempted to avoid the truth. Hiding from the truth only makes grief recovery more difficult. Simply be there to listen and comfort with your presence. In listening, you should be prepared to hear and accept a wide range of emotions. You may be uncomfortable with the intensity of expression of these emotions. However, it is important for survivors to express themselves without being silenced. Don’t try to calm survivors down or cut short their expression of emotion. The freedom to work through anger and grief in an individual way will hasten the healing process. Remember this: The most difficult period for the family is probably still weeks away. During the initial period of shock, the survivors are not feeling many of the emotions they will feel later. You may meet the greatest need six to eight weeks following the death and again as the one-year anniversary of the suicide approaches. Survivors need to know that you care and they need to discuss their feelings and frustrations. Your support and encouragement can make a huge difference. •	Don’t be afraid to discuss the subject of suicide with survivors, but temper your comments. Grieving survivors need to be acknowledged, not ignored. •	Let the person know you care. As the well-known saying goes, “People don’t care what you know until they know that you care.” Sharing your concern for survivors helps them know they are not alone in there pain. •	Be a good listener. Allow a survivor to talk about what he is feeling. It is important for you to listen closely to anything the person says. Much talking on your part will not be very effective because the person is in a state of mind that will not allow him to listen or absorb all you are saying. Do everything you can to let the person know you are there for them and willing to listen without judging or challenging. •	After the shock has passed, you might encourage counseling or support group attendance. If they agree, you could help by making some calls for the person to locate a counselor, clergy, or a Survivors of Suicide support group Maybe offer to drive your friend to and from the appointment or meeting. •	Be practical. What can you do for the person right now? Can you provide childcare, meals, or transportation? Be specific about what you are willing to do. So reads the first stanza of my favorite poem by Emily Dickenson. I have done a lot of meditation on “hope”. How many times a day do we use that word? How many times is it the only thing that is holding us together? I wrote the following poem a few years ago at a time when hope was the anchor keeping me from floating away in despair. what’s just beyond the bend. Hope keeps checking the mailbox. the soul from drifting to despair. that always meets the last train. I thought I would write this D-mail as a meditation on hope. Perhaps there are some out there whose hope is deferred or very weak. For you, dear friend, I send this message of hope from our Lord, Jesus Christ. May these scriptures strengthen and preserve all of you who are hoping for something. It was the coldest winter ever. Many animals in the forest were dying because of the cold. The porcupines, realizing the situation, decided to group together. This way they would be able to cover and protect themselves from the frigid cold. However, even though they gave off wonderful heat to each other, the quills of each one began to wound their closest companions. After a time, they decided to distance themselves from one another because togetherness was just too uncomfortable. Sadly they began to die, alone and frozen. The wisest of the porcupines gathered them and spoke. The porcupines discussed the matter and, seeing the wisdom of their Elder, decided to go back to living together. They learned to live with the little wounds that were caused by living closely to their fellow porcupines. 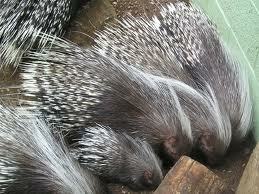 In exchange, the porcupines survived the outside cold by basking in the heat that came from the others. While few of us will ever need to live huddled together like the porcupines to keep out the cold, we all belong to families, to the groups we work with or go to school with or worship God with. Let’s face it, among our companions in all these groups, there are some “porcupines” that wound us with their sharp comments, actions, or attitudes. And we wouldn’t be human if we too didn’t have sharp quills of our own. When we are willing to tolerate and forgive these wounds, we find warmth and comeraderie and perhaps even unconditional love as a reward. When our “quills” come up against another’s, it is an opportunity to grow and learn. Moral of the story? The best relationship is not the one that brings together perfect people, but the best is when each individual learns to live with the imperfections of others and can admire the other person’s good qualities. Proverbs 27: 17 says, “As iron sharpens iron, so one man sharpens another.” Iron and quills can develop and mold character if we let them. Perhaps the pricks from a brother’s quills can change a sinner’s ways as James says , “My brothers, if one of you should wander from the truth and someone should bring him back, remember this: Whoever turns a sinner from the error of his way will save him from death and cover over a multitude of sins.” James 5: 19-20. So what are a few quill pricks now and then when we know how to forgive, when we are humble enough to learn from them? Surely the rewards are worth it.